Robert Lardner showing side lying exercise, working with Dr. Erica Boland, and Marcela Safarova lecturing. 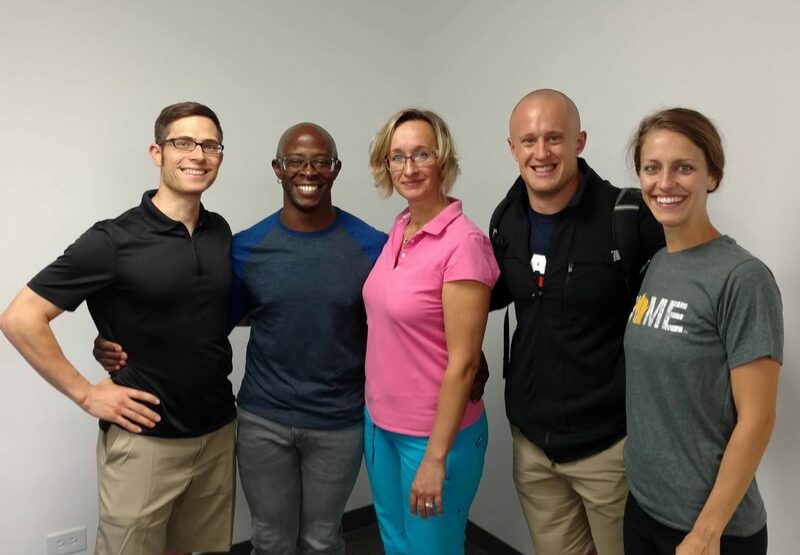 Last weekend, I had to pleasure to attend a conference just outside of Chicago to continue my education in Dynamic Neuromuscular Stabilization (DNS). Based upon the groundbreaking neurodevelopmental and rehabilitation principles described by key neurologists/physiatrists, DNS offers a new generation of clinical protocols that are designed to restore and stabilize locomotor function. The course I attended, Intermediate C Course, is the next step on the pathway toward becoming a DNS Certified Provider. Travelling from Prague, Marcela Safarova, DPT, Ph.D., was our lead instructor. Marcela Safarova serves as head physiotherapist at Clinic of Rehabilitation ad Sports Medicine, Faculty Hospital Motol, Prague, Czech Republic. Marcela was joined by renowned physical therapist, Robert Lardner. Robert has an incredible history in clinical practice and currently owns his own clinic in Chicago. Sensory input is important. If muscles are too tight – or hypertonic – a person can no longer feel the muscle. Rehabilitation of these muscles may take longer because the brain needs to relearn appropriate muscle tone and engagement. The need to perceive form and muscle tone is more more important than the need for strength. Foundational Movements are like the ingredients for baking a cake. Without good ingredients, the cake will not turn out appropriately. Dr. LoRang working with Dr. Boland to attain appropriate thoracic spine motion while maintaining intra-abdominal pressure. The importance of glenohumeral joint “centration” (proper alignment) can not be emphasized enough. Because the glenoid is quite shallow, and because the humeral head is quite large, there is a proclivity toward compensation. Marcela Safarova working with Dr. Sandmaier on glenohumeral joint placement and centration. Movement and treatment of the thoracic spine is very important in treatment of shoulder problems. 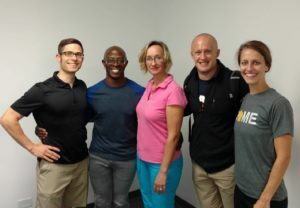 And, to top it all off, I was able to see some old friends: Dr. Adam Sandmaier from Sherwood Park Chiropractic, Dr. Erica Boland from Coulee Health and affiliate of Birthfit, and Dr. Mark King from Mt. Lookout Chiropractic Center and President of the Motion Palpation Institute. For more information and treatment options, please call 515-421-4018 for an appointment. Marcela Safarova working on Dr. LoRang to engage appropriate movement pattern.